Fielden, and brother Shepherd Collins, called Rosanna PERKINS their sister, on Cherokee applications. 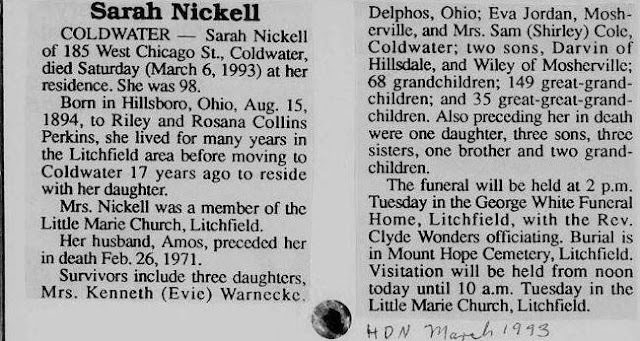 Fielden and Shepherd are sons of John Collins and Louisa Cole, therefore Rosanna is daughter of John Collins and Louisa Cole also. The grandparents are Shepherd and Polly Collins and Valentine and Mariah Cole. 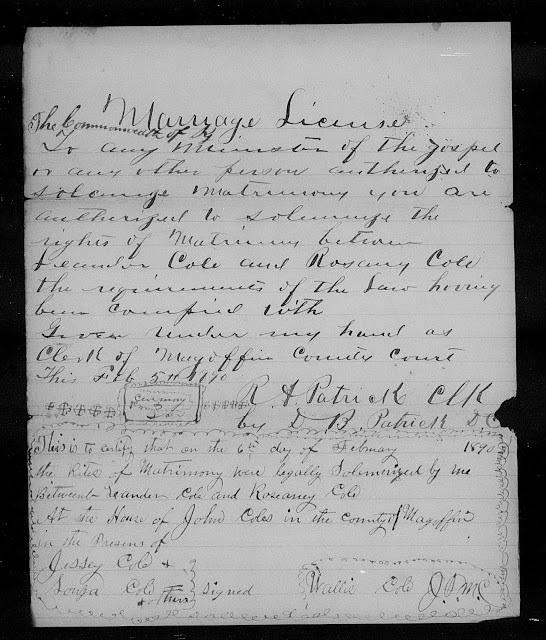 She married to E. E. Guin [Elza McGuin] on May 7, 1893 and had two sons; Benjamin and Tom McGuin. 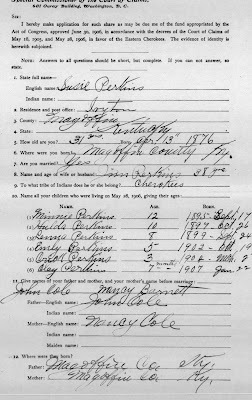 Both of these records show Rosanna's name as COLLINS, they are found on the 1900 census living in Salyersville, Kentucky with sons Benjamim 1895, Tom born 1896 [both listed as Perkins] and Sarah K., born 1899. 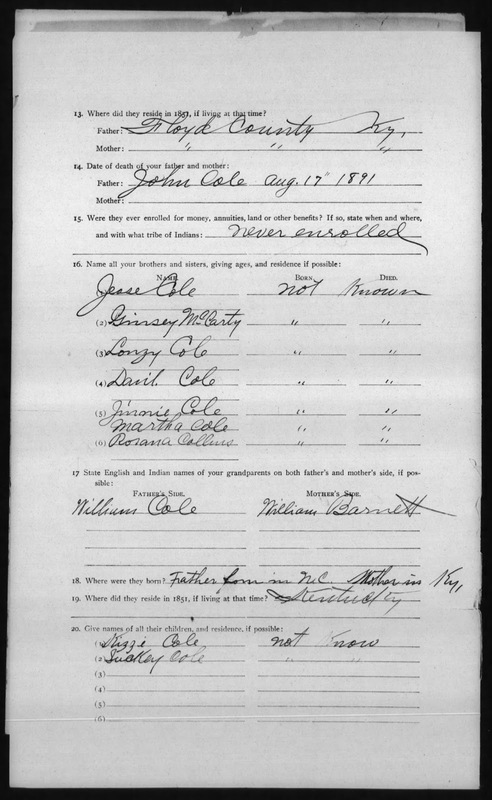 Leander Cole married Rosenna COLE, daughter of John Cole and Nancy Barnett in 1890 in Magoffin County, Kentucky. 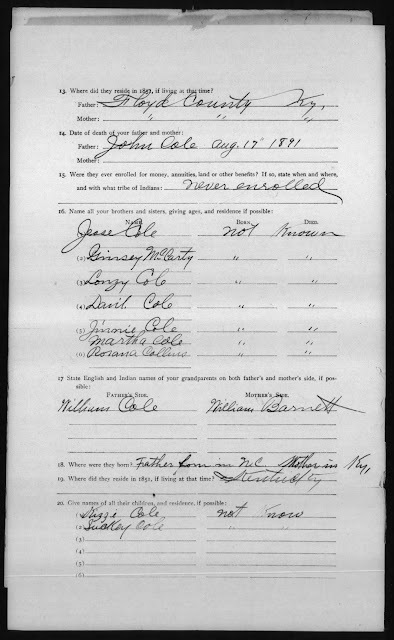 Susie, daughter of John Cole and Nancy Barnett, names her sister Rosanna COLLINS who was married to Leeander Cole/Collins in 1907. In 1900 Leander and wife Rosa Cole are living in Abbot, Floyd County, Kentucky. Rosanna had these children; Junie Nov 1890, Eddie May 1893, Lewis Nov 1895, Gincy 1898 and Lindsy May 1900. Clearly Rosanna COLLINS married to John RILEY PERKINS is not the same as Rosanna COLE who married to Leander COLE. Both women are on the 1900 with their husbands and children. 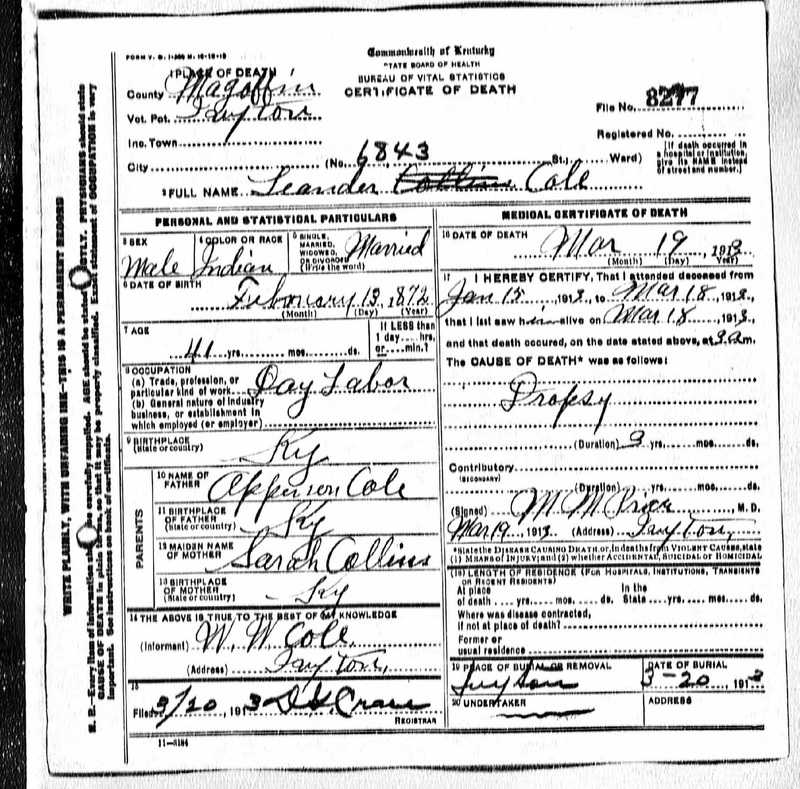 Both of these documents call LeeAnder a COLLINS and in 1915, 2 years after Leeander died Rosanna married to William RILEY Perkins the widow of Barbara Wadkins/Watkins. Rosanna, widow of Leeander used his name of COLLINS. WILLIAM Riley Perkins married Barbara Watkins/Wadkins 26 Sep 1885 in Magoffin County, Kentucky. 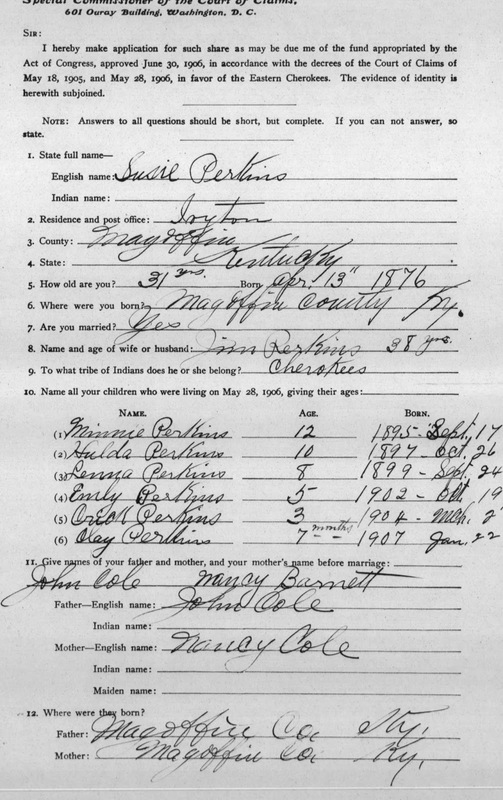 In 1900 this family was living in Abbot, Floyd County with the following children; Riley Perkins wife Barbery -Lindy Aug 1886, -Gracie Oct 1889, --- -Nellie Oct 1890, -Bertha Dec 1893, -Lola Oct 1895. This is not Rosanna, wife of John Riley Perkins. 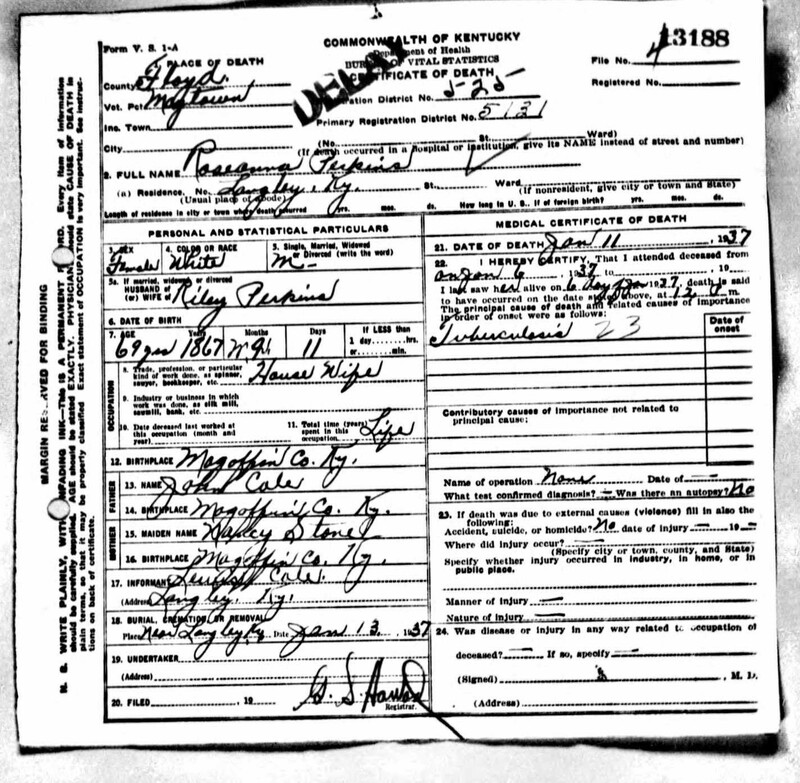 Both are found on the 1940 Census in Magoffin Co., Kentucky living with their widowed daughter, Mary Cole and grandchildren, Rosanna COLLINS PERKINS was not dead in 1937. 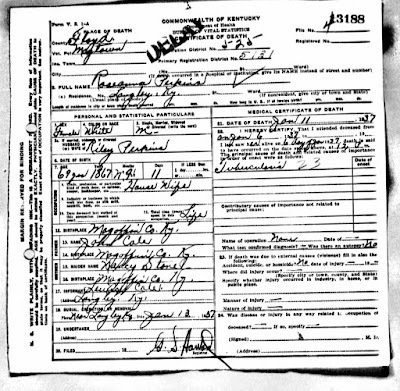 Riley Perkins, son of 'Dickie Perkins' and Mary Wright died December 29, 1945 in Lakeville, Magoffin County, Kentucky. On his death certificate it states he was "married" meaning his wife Rosanna who is living with him 5 years earlier did not die in 1937. 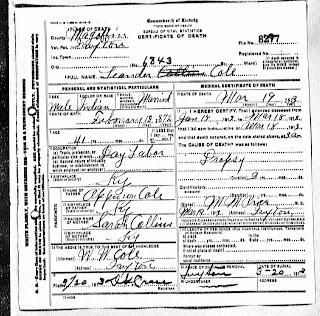 The above death record is obviously of Rosanna Cole daughter of John Cole and Nancy Barnett, widow of Leeander Cole and married to William Riley Perkins. This is the obituary of Sarah K., daughter of John Riley Perkins and Rosanna Collins, as recorded in the above census. And Rosanna Collins, wife of John Riley Perkins, mother of above Sarah Perkins Nickell.